Teachers should learn strategies for asking questions, responding to student thinking, and scaffolding student conversations in an effort to broaden equitable opportunities for students to engage in classroom talk. District Staff & PD Providers should work with teachers to support and reflect on classroom conversations. School Leaders should learn the ways talk can be organized to foster science learning opportunities for students and support teachers in orchestrating such conversations. Teachers need ways to encourage opportunities for all learners to engage routinely in sensemaking talk. Teachers can also use student talk to learn about student ideas and thinking. However, it is often challenging to facilitate productive conversations, especially with students who are not accustomed to talking in their science classes. Teachers can use tools to scaffold student science talk. They can then reflect on what they have learned from students to inform next steps in their instruction. How can you focus the questions you ask to support students’ 3D science learning? Are students engaging in and reflecting on science and engineering practices? Are you gauging their understanding of core ideas and crosscutting concepts? How can you collaborate with colleagues to support each other in improving classroom talk? What types of questions are you asking? What are some alternative questions that might expand conversational participation? What types of prompts help facilitate conversation in pairs? In small groups? Whole class? Chapter 11 from the NRC Framework outlines a vision for quality science education for every student. Classroom talk fosters shifts in participation, and, as a result, opens opportunities for learning in the science classroom. Student talk also helps educators consider how to connect young people’s everyday languages with language common in the scientific community. Strategies for fostering classroom talk are important for facilitating sensemaking in the classroom. Engaging students in science classroom talk makes student thinking public and available for discussion, clarifies ideas, deepens reasoning, and helps students relate their thinking to others’ ideas (see related research). Students should engage in talk as they participate in each of the science and engineering practices of the NRC Framework vision. Teachers can engage in informal formative assessment by engaging students in classroom talk which involves eliciting, recognizing, and attending to student ideas during classroom talk. All students should have opportunities for processing their thinking through talk. By promoting opportunities for student voice, teachers signal that the ideas students have are valued and importance. All students should have access to productive discussions that allow them to sharpen their critical reasoning and analytical abilities while developing their science communication practices. Teachers need to ensure that the discourse environments they create promote science learning for students who bring many different perspectives and histories to the classroom. Center your instruction around the idea that the person doing the talking is the person doing the learning. Use whole class discussion sparingly. Focus more on scaffolding small group discussion. 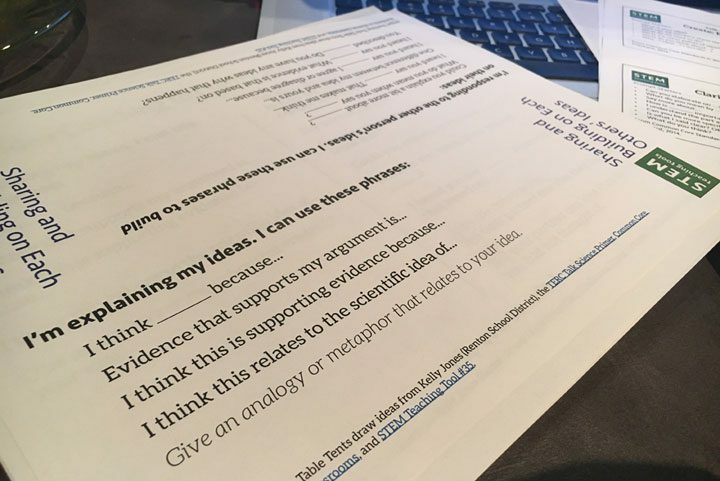 Use our Talk Resource Tools to foster shifts in science classroom talk practices: The Talk Resource Cards and Partner Conversational Supports expand productive classroom talk during conversations, while the Pre- and Post-Talk Writing Supports can be used to bookend classroom conversations to improve students’ sensemaking and science communication practices. Use classroom talk to collect formative assessment information, and consider how that knowledge can be used to serve students individual needs to equitably engage them in science learning. Try strategies laid out in the Talk Science Primer and the Accountable Talk Sourcebook by yourself, with teacher colleagues, or with others in your network.